Safety from moisture. Delta's dimpled membrane is impermeable to water and water vapor and allows any water that does get through the foundation to flow freely to the perimeter footing drain. Everyone agrees that a wet basement is a disaster worth avoiding. But there are many opinions about the best way to keep a basement dry. At BlueMaxx Basement Systems, our aim is to use the best basement waterproofing technology available. That’s why we install the Delta®-MS exterior membrane. A dry basement is just a phone call away. Contact the waterproofing experts at BlueMaxx Basement Systems to schedule an inspection and Free Estimate. 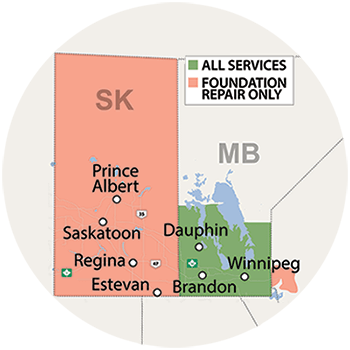 We service the entire Greater Winnipeg area, including Portage La Prairie, Brandon, Winnipeg and nearby. Long-lasting & strong. DELTA®-MS is made from High Density Polyethylene (HDPE) and other additives which protect the membrane against oxidation and provide compressive strength, resistance to impact, and protection against chemical and environmental stress cracks. 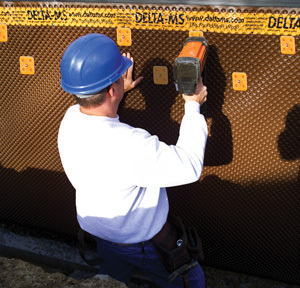 The Delta®-MS damp-proofing membrane is a semi-rigid, heavy-duty polyethylene sheet material developed by a leading global manufacturer of building products. 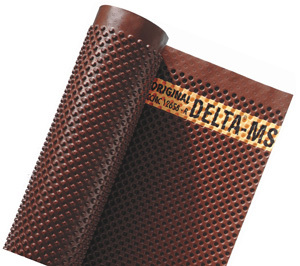 The Delta membrane is strong, durable and totally moisture proof. It’s also got a unique form designed to optimize drainage. The membrane is smooth on one side and packed with 5/16-in.-high dimples on the other. During installation, the dimpled side of the membrane is placed against the foundation wall, creating an air space that protects the foundation wall from standing water and hydrostatic pressure. Because seams in the Delta®-MS membrane are overlapped and sealed with special waterproof tape, the membrane provides a continuous moisture barrier on the outside of your foundation. But if any water gets past the membrane, the airspace created by the dimples enables water to flow freely down to the footing drain. When we install the Delta®-MS membrane, we also install a new footing drain (aka “weeping tile” drain) as part of the waterproofing system. We recommend the Delta-MS damp-proofing system to all home and business owners who are concerned about basement water intrusion. We can install this high-performance drainage system on new or existing houses, as the main waterproofing system or in addition to an interior drain and sump pump system. As Greater Winnipeg's leading basement waterproofing contractor, we're here to help our customers decide the best way to protect their home. Don’t risk basement flooding by waiting for the next storm. Contact BlueMaxx Basement Systems today to schedule a free foundation inspection and estimate to install the Delta-MS system. We also install the Delta®-FL vapor barrier sub-floor system for concrete and slab-on-grade basement floors.